FeastHome – Do you have a small kitchen area in your house? Are you confused how to arrange all the kitchen utensils and kitchen elements in your limited kitchen area? Do not be worried, there are some tips that you are able to follow in order to save spaces in your kitchen. 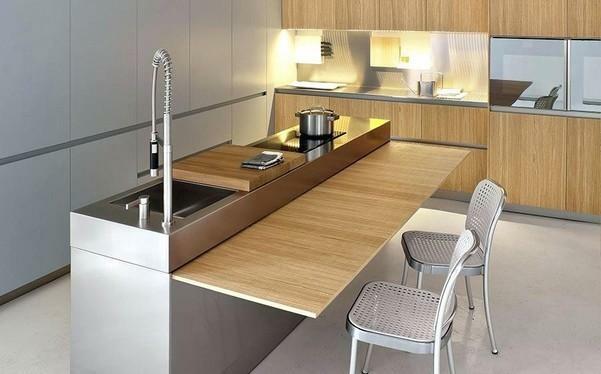 For you who have a small kitchen area, here are some inspirations of a modern saving spaces kitchen. The middle area of this kitchen is left empty, making the kitchen area itself looks more spacious. A lot of kitchen cabinets are used in order to save all the kitchen tools and tableware so that the area looks neater and cleaner. The white color that dominates the kitchen area is adding a brightness and make the area looks even more spacious. The wooden kitchen floor brings a warm and natural atmosphere. For you who want to have a super saving space kitchen, you can follow this idea. 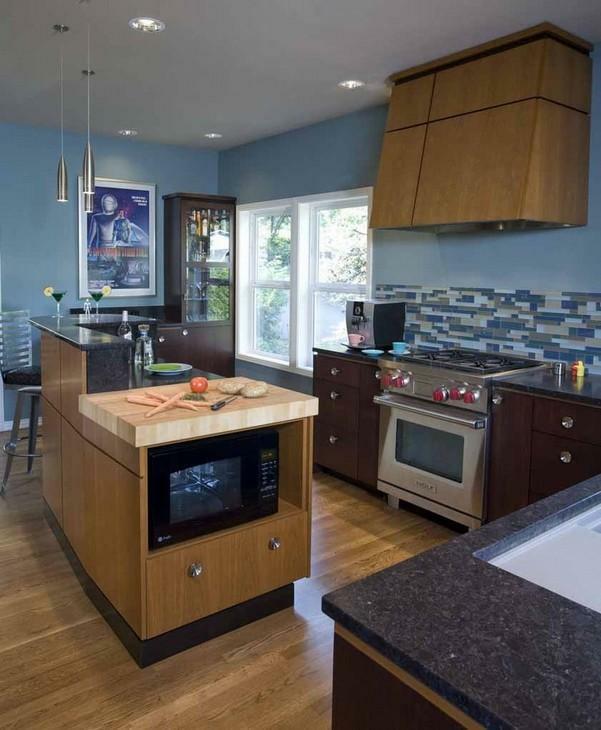 The calming blue color of the kitchen walls matches perfectly with all of the kitchen elements in this area. From the white window, marble countertop, wooden kitchen cabinets, and even the wooden kitchen floor. A pattern is added to one side of the kitchen wall in order to make the area looks more attractive. The small curved dining table unites with the kitchen table, which is a great idea to accentuate a practicality and save some spaces in the kitchen area. Moreover, the clear glass window allows the sunlight comes into the area and make it looks larger. This kitchen area is already spacious, but the householders use many kitchen cabinets to store the kitchen tools and tableware so that the area looks even bigger and neater. 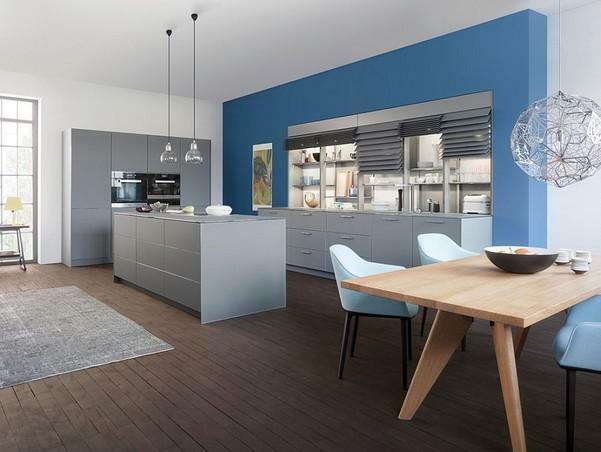 Blue, grey, white, dark brown, is a great combination to create a modern look. The dining area is placed on another side of the area since there are enough spaces. A unique hanging lamp is installed in the dining area in order to make it looks artsier. While for the kitchen area, the householders prefer 2 simple long hanging lamps. Do you want to know an instant tip to make your limited kitchen area looks more spacious? 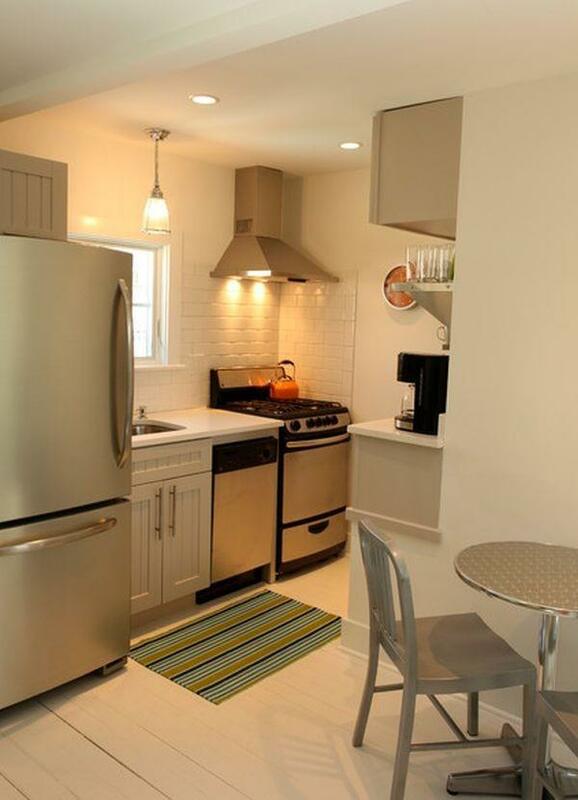 Choose white as a dominant color in your kitchen just like you can see in the picture above. White is able to add brightness, create a simple and clean look, and also make an area looks more spacious. 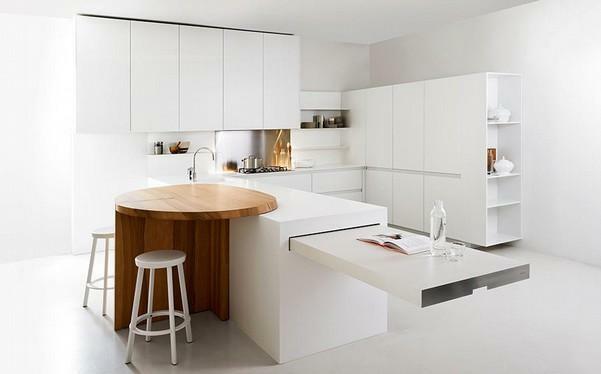 White is dominating this kitchen area, from the kitchen walls, kitchen cabinets, floor, and kitchen table. A floating table is used which is a smart idea if you need an additional table and save spaces at the same time. A wooden small round dining table is chosen in order to add a color to this kitchen area so that it looks less boring and plain. The householders use a floating table as a dining table that unites with the kitchen table. It is a double great idea in order to save some spaces in the kitchen area. The modern style from the stainless steel sink and kitchen faucet blend perfectly with the warm and natural style from the wooden kitchen cabinets and wooden floating dining table. There is also not much kitchen utensils in the kitchen area that makes it looks neater. 2 meshed stainless steel dining chairs are added in order to add an attractiveness to the area. As you can see, the kitchen area above is small, but the householders arrange the layout finely so that all elements have their spaces. The householders can still even a dining area by choosing a small round dining table and 2 dining chairs. A wall-mounted kitchen cabinet is a great idea to have a storage in a small kitchen area. A rack is added in the bottom of the wall built-in kitchen cabinet in order to provide an additional storage. This kitchen uses the dim lights so that it looks so warm. 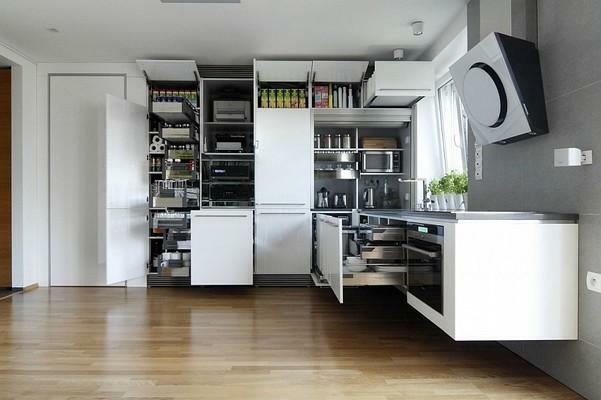 This white kitchen cabinet is very practical because some racks are installed inside it. 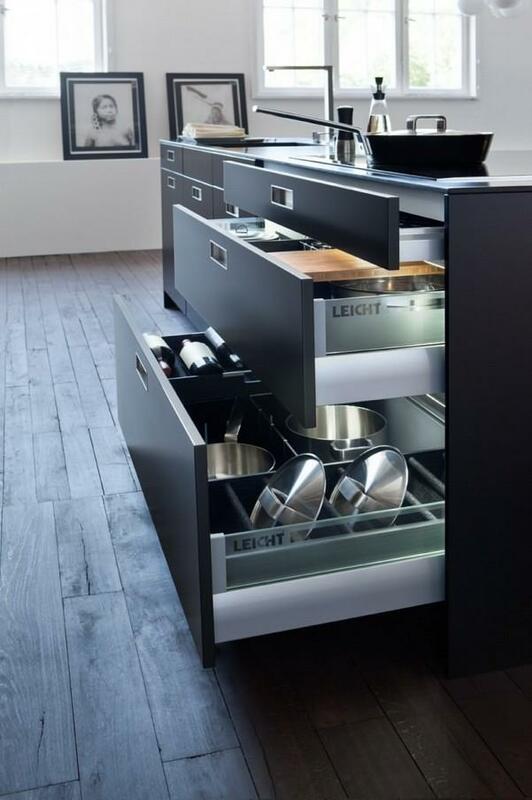 This kind of kitchen cabinet is suitable for you who need a storage to save your big kitchen utensils such as a pan and pot just like the image above. This practical kitchen cabinet is also able to be an alternative for you who do not want an open kitchen cabinet or hanging up pots. The wooden racks match beautifully with the white color. This kitchen cabinet has 3 racks of different sizes. So that the householders can use each rack which is fit with the sizes of the kitchen utensils that are going to be stored there. The small-sized rack can be used to store the tableware such as spoons and forks. 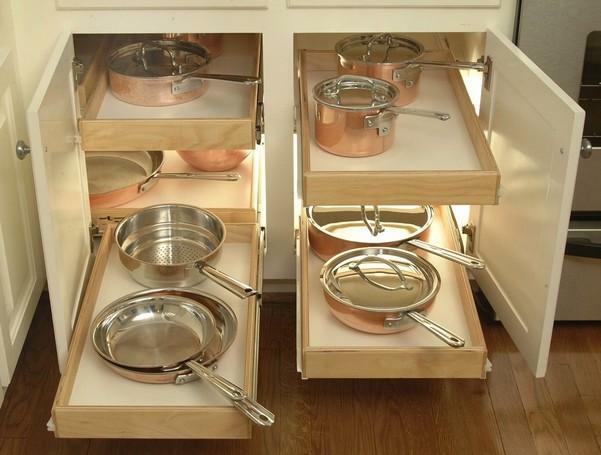 While the big-sized rack is able to be used to save the big kitchen utensils such as a big pot or pan. This kitchen cabinet is also completed with a small wine cellar so that it is very practical and able to save spaces in your kitchen. The householders use some things which are able to save spaces in this small kitchen area. Such as the magnet bar which is used as a storage to simply stick the knives and the wooden hanger to hang up the kitchen pots. If your small kitchen is not possible to have a kitchen cabinet, you can follow this idea to store your kitchen utensils. 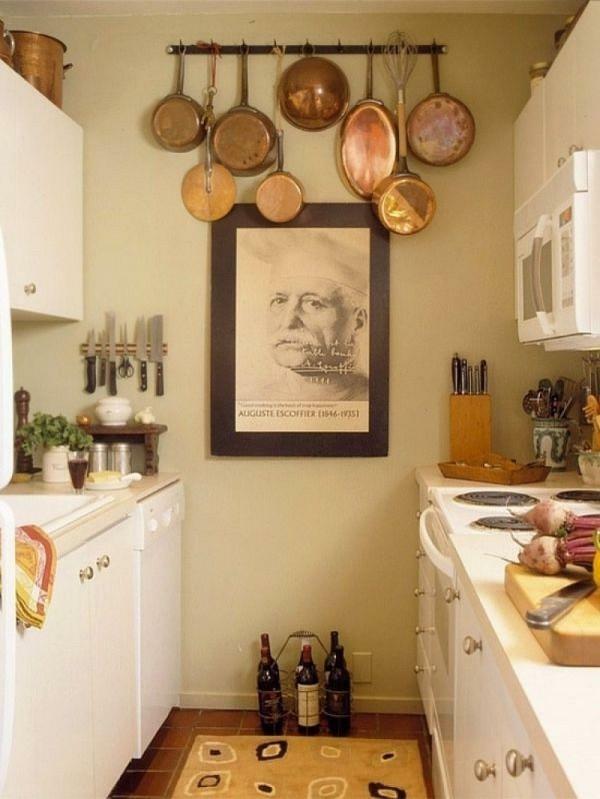 A poster is placed in the wall as a decoration in order to make the kitchen area looks less boring. The use of an induction stove and floating kitchen table is a great combination to save a lot of spaces in this kitchen area. You can use an open rack just like in the picture if you cannot have a kitchen cabinet or shelf in your kitchen to store your tableware or kitchen tools. The blue lighting in this kitchen makes it looks aquatic and magical. 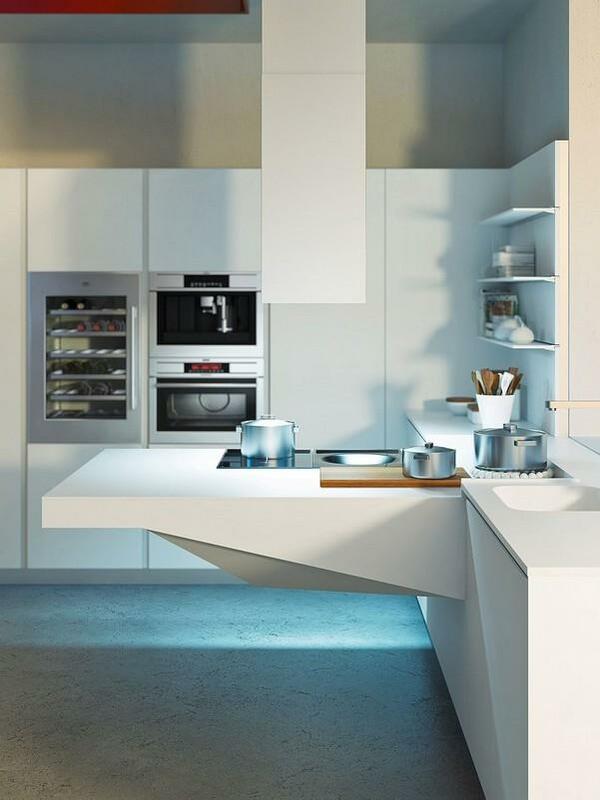 Those are the ideas of a modern saving space kitchen that can be your inspiration.